Laura is one of the world’s top professional female freestyle footballers, and is a Guinness World Record holder four times over! 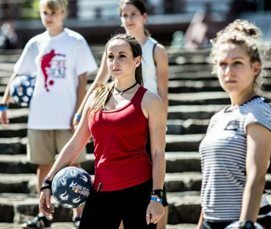 Female freestyle football is a growing art form, but there are only 5 ladies in the world who make a living from it professionally. 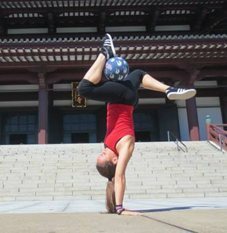 Laura is a 4 times world record holder and holds the record for ladies for the most amount of around the world tricks inside one minute (currently at 57), most amount of headers in a minute (218), most shin juggle in one minute while sitting down (103), most sole juggles in one minute (135). Laura can perform at your event anywhere. Some events that she is experienced at performing in include parties, schools events, street shows, festivals, big staged events, stadiums for half time entertainment, on top of buildings for PR stunts, movies, TV & video doubles. 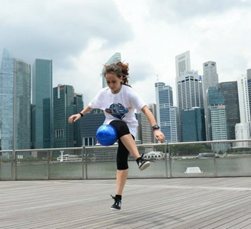 Very popular with family related and inspirational events especially for young females are the freestyle football workshops where anyone (no matter how good their co-ordination skills are) will be able to learn a combination of tricks within 10 minutes. Men are often the most impressed when a lady like Laura teaches them a football trick or two. Workshops can be provided at events should members of the public or event attendees like to try out the street sport/art form. A sound system with music is obligatory and must be provided. A portable sound system can be provided if no sound system is available. The minimum spacing required is 5m x 3m. The floor must not be wet. Laura can perform on smooth wood, smooth metal, smooth concrete, tar mac, marble, grass and carpet. Laura will bring her own football (unless the client needs her to use a specially branded one). Laura usually wears a football kit, but can wear an outfit requested by a client. The show lasts for 5 minutes. The workshops can last between 30 -60 minutes. Laura can also do a walkabout set. “Each event is unique and every time it’s something new, that’s what I like in the events industry. I love everything about this industry”. “I like to see every performance in a positive view and since each experience is unique they are all my favourites”. “I see the negative parts just as lessons to become better and not a bad thing. I get my inspiration from music, other freestylers but also dancers and singers help a lot to come up with new ideas but it all come from inside and expressing what you feel through your skills”. “The other entertainers I admire the most are singers like Shakira, J lo and Beyoncé., they are all women to admire as they paved the way and stand up for women. Athletes wise Mia Hamm has been my all time favourite female football player but Totti is my idol! Freestyle wise Soufiane Bencok is my favourite”. “It’s hard to explain but I just find time for everything as it’s all important. I have less social life as I prefer to train than go out to bars and nightclubs”. “Not everyone believes that women can do amazing things with a football. I want to keep free styling, win the world championship and inspire more girls and open doors for them”. Incredible energy and constant entertainment provided by Laura throughout the whole fan park. Laura’s work makes all the guys sit up and take notice. A great performer and ambassador for the art of freestyle. It went well thanks, lots of consumers interacting with Laura – she was great and the client loved her.